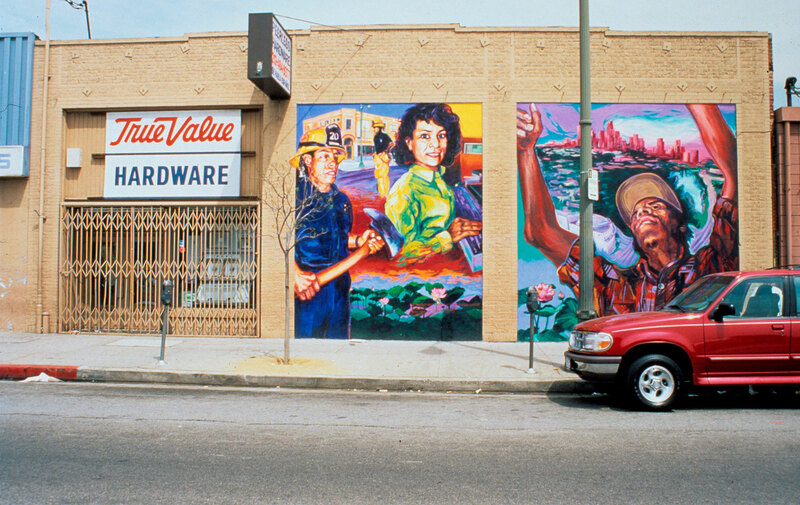 Los Angeles was once the mural capital of the world. 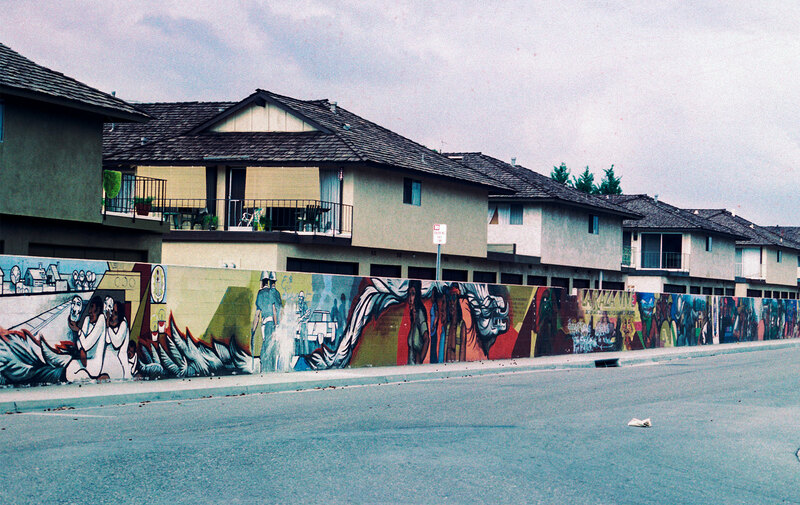 Thousands of murals were painted here—and in nearby cities and counties—in the late twentieth century, most of them by Chicana/o artists. Many appeared as part of el movimiento, the Chicana/o civil rights movement. These works challenged what some people believed about art and society. 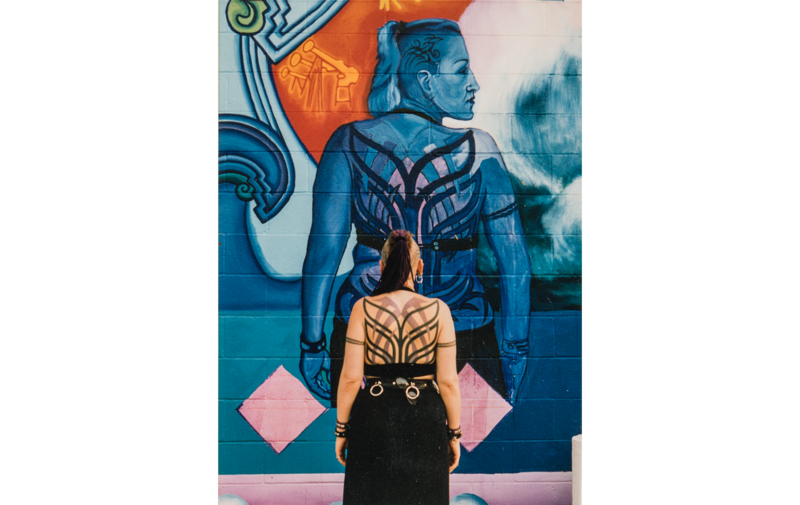 Instead of working alone, Chicana/o artists often invited community members to help plan and paint. More than decoration, their murals conveyed powerful messages. They called attention to unequal treatment of Mexicans and Mexican Americans; celebrated Chicana/o heritage, history, and neighborhoods; and expressed pride and power. Such qualities threatened people in positions of authority and many responded negatively, endangering Chicana/o murals. ¡Murales Rebeldes! presents stories of eight Chicana/o murals that were censored, neglected, whitewashed, and even destroyed. They are a small fraction of the hundreds of murals under siege. 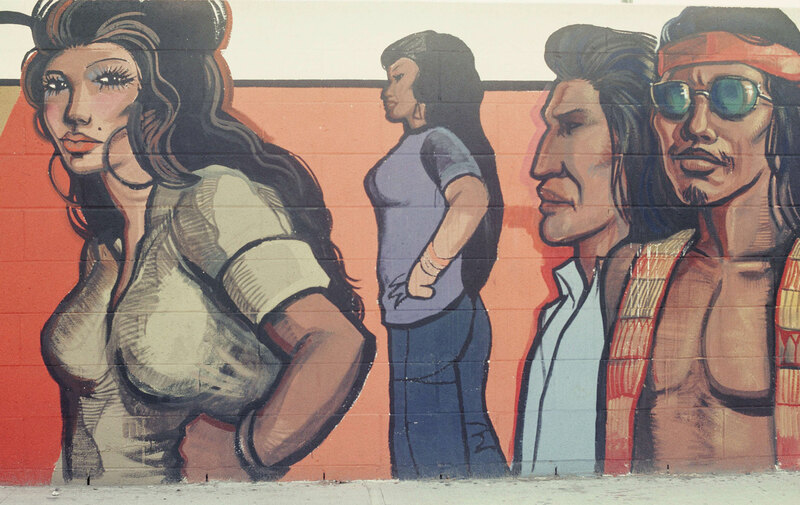 Their fates represent a larger issue: without protection and advocacy, Chicana/o murals—a cornerstone of Los Angeles’s cultural and historical heritage—remain imperiled. We celebrate these important works of public art in the hope that Los Angeles will flourish as mural capital once again. 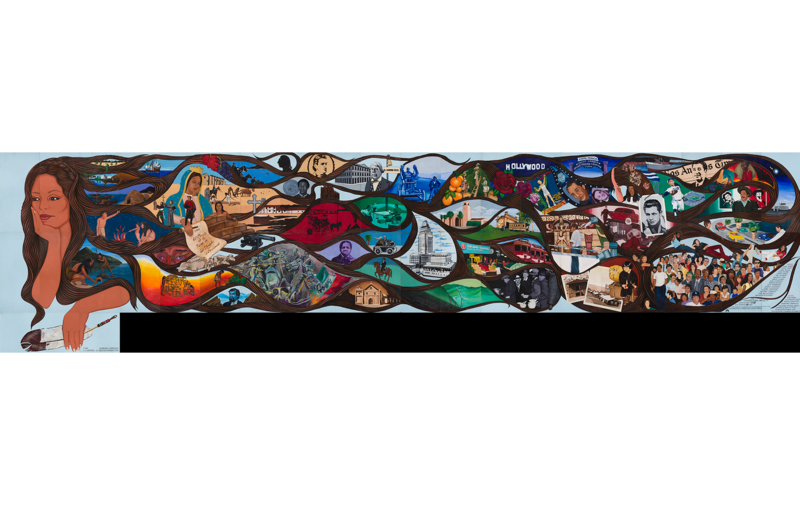 Barbara Carrasco’s 1981 portable mural contains 51 scenes depicting the history of Los Angeles. Some told troubling—but true—stories about the experiences of people of color. 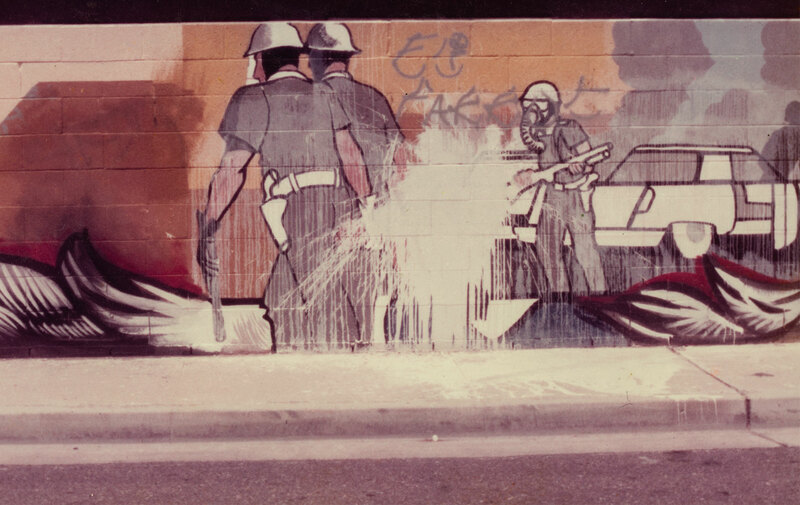 A hallmark of L.A. History is Carrasco’s frank telling of history, from a Chicana perspective, which to many observers made her mural a target for censorship. 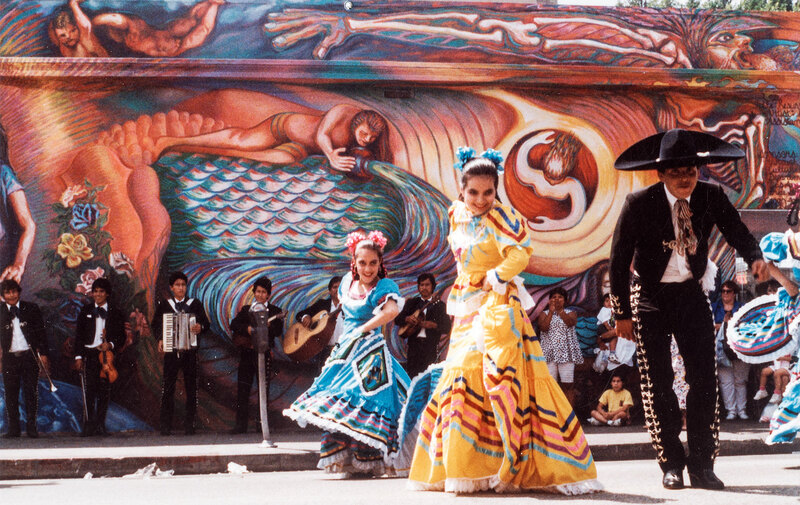 Courtesy of California Historical Society/LA Plaza de Cultura y Artes; photo: Sean Meredith. The agency that commissioned the mural rejected 14 scenes featuring the experiences of L.A.’s marginalized groups. 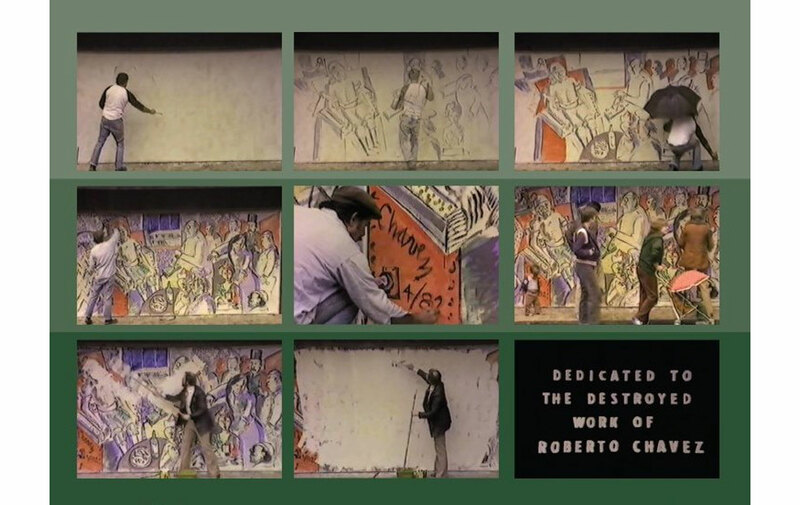 These included the Zoot Suit Riots (top right); the whitewashing of América Tropical, a 1932 mural by Mexican artist David Alfaro Siqueiros (center); and the World War II incarceration of people of Japanese descent (bottom right). California Historical Society/LA Plaza de Cultura y Artes; photo: Sean Meredith. 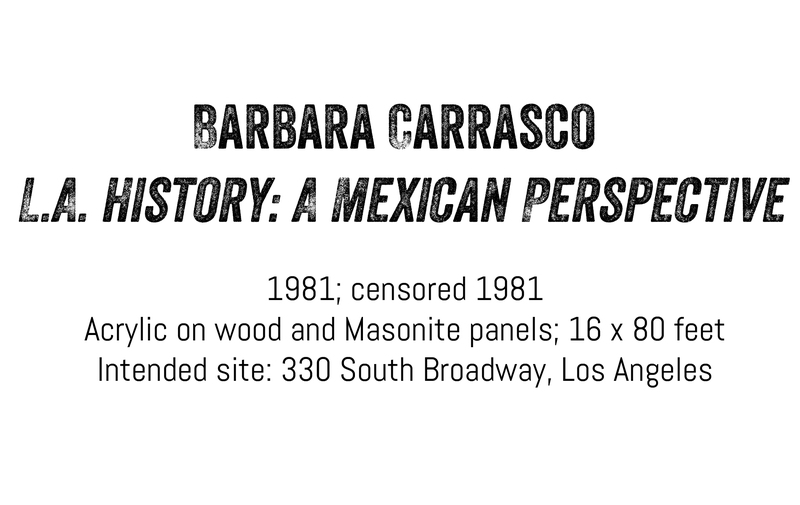 Carrasco refused to change L.A. History and fought against its censorship. 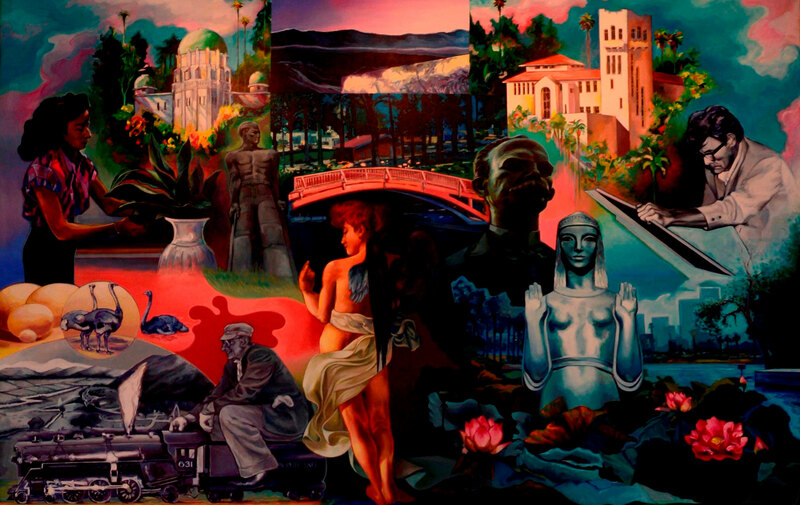 Despite a brief showing at the 1990 Los Angeles Festival in Union Station, the mural has never been displayed in its entirety. 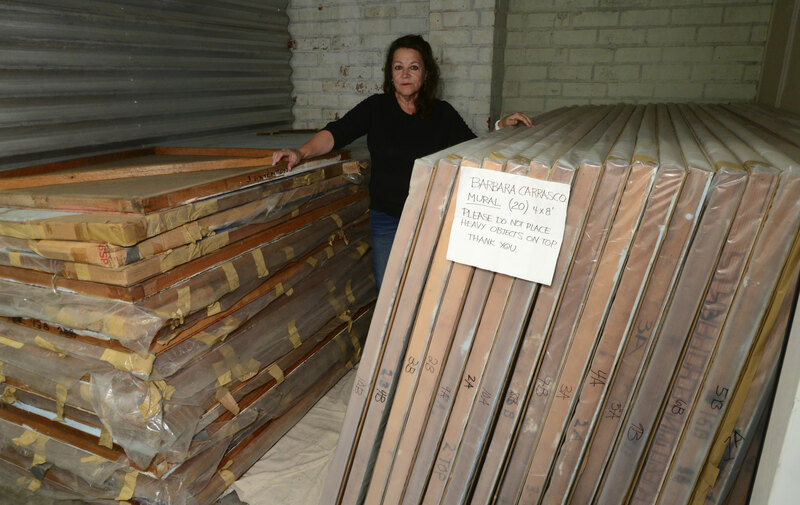 Today, the 43 wood and Masonite panels that make up the mural currently reside in a Pasadena storage facility, unseen by the public. California Historical Society/LA Plaza de Cultura y Artes; photo: Oscar R. Castillo. 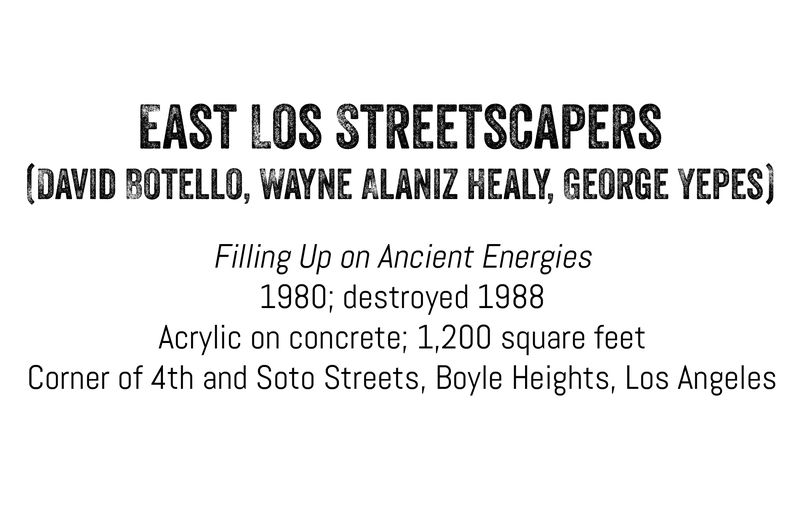 On May 23, 1988, David Botello of East Los Streetscapers received an urgent phone call. Workers were bulldozing the wall on which Filling Up on Ancient Energies was painted to make way for a parking lot. Botello rushed to the scene, where he rescued several fragments of the mural, including pieces displaying the Streetscapers’ copyright symbol. Courtesy of David Botello, Wayne Healy, and George Yepes; photo: David Botello. On May 23, 1988, David Botello of East Los Streetscapers received an urgent phone call. Workers were bulldozing the wall on which Filling Up on Ancient Energies was painted to make way for a parking lot. Botello rushed to the scene, where he rescued several fragments of the mural, including pieces displaying the Streetscapers’ copyright symbol. Courtesy of David Botello, Wayne Healy, and George Yepes; photo: David Botello. 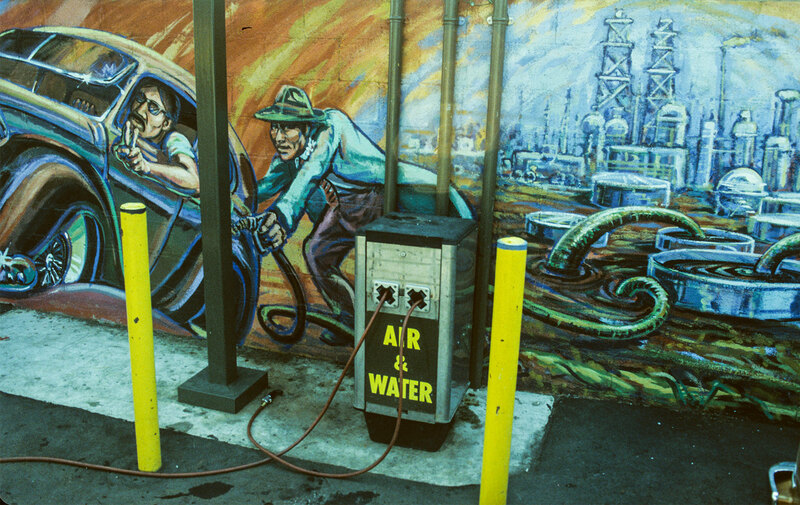 Commissioned in 1980 by Shell Oil for the wall of a gas station, the mural suited its site adjacent to a high school. It spoke to—and for—the local culture, featuring ferocious dinosaurs on the verge of extinction, conversion into fossil fuels, cruising scenes, and inspirational portrayals of Mayan deities passing down knowledge to local youth. The mural blended seamlessly into its location, but in 1988 the station’s new owners destroyed it without first informing the artists. The Streetscapers sued Shell Oil and won a financial settlement. The case also brought murals under the state’s protection for the first time, a ruling that safeguards Los Angeles’s murals to this day. Courtesy of David Botello, Wayne Healy, and George Yepes. 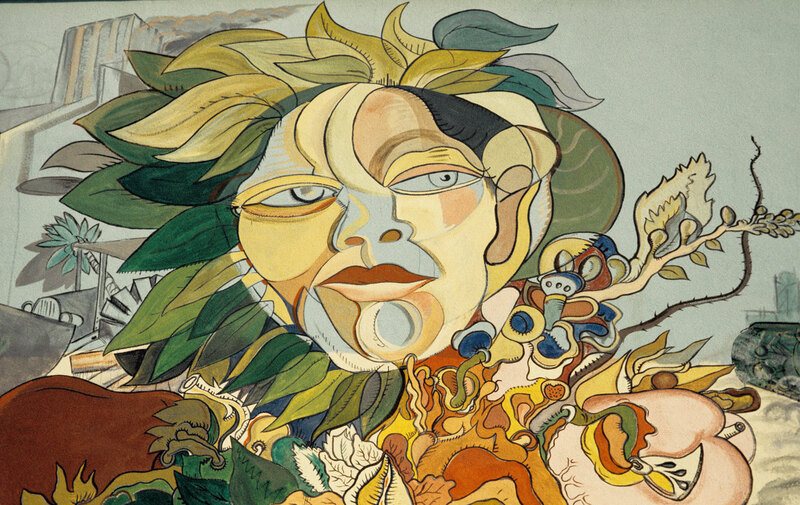 In 1974–1975, Roberto Chavez painted an enormous mural on the East Los Angeles College (ELAC) auditorium. Inspired by the Chicano civil rights movement, he combined images of nature with symbols of deceit and war. In 1979, college administrators whitewashed the mural. Was it “too Chicano”? Private collection; photo: Manuel Delgadillo. Made up of dense imagery, the mural was rich in symbolism but not easily interpreted. At its center was the head of a woman, which Chavez obliquely has referred to as Our Mother. This detail shows how Chavez painted across stylistic barriers of culture and time. 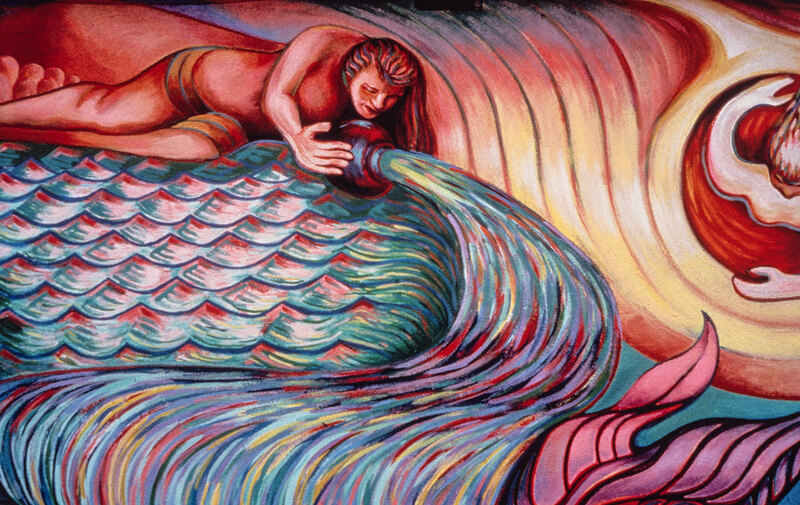 “My work has not been typical of Chicano artists,” he has remarked. UCLA Chicano Studies Research Center. 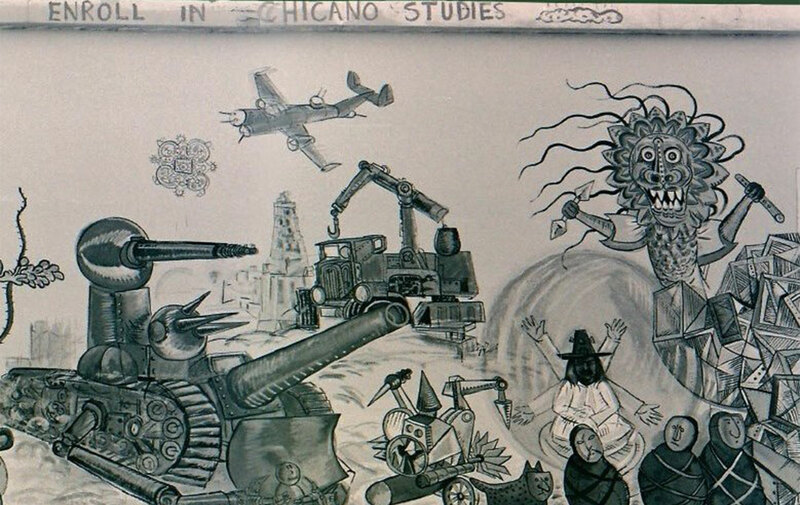 In the mural, Chavez promoted ELAC’s Chicana/o studies department, which he chaired. 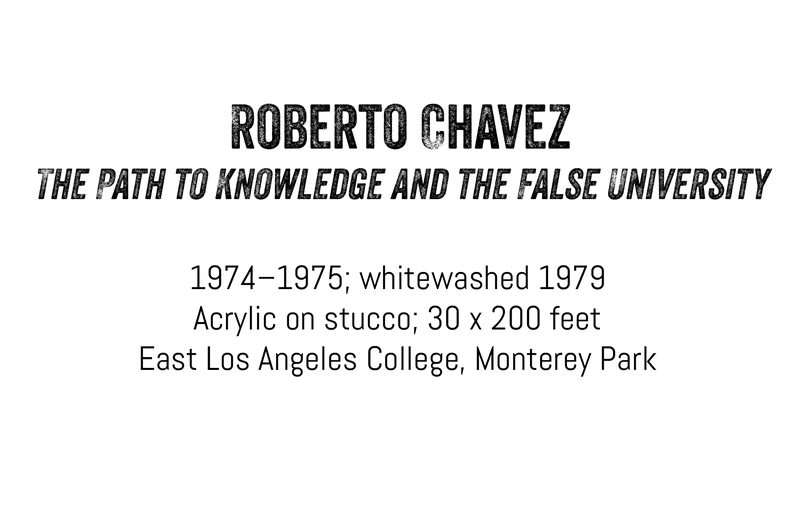 Some students and faculty believed the mural was whitewashed because of administrators’ concerns about Chavez’s connections to campus political and social movements. Although ELAC’s president claimed that the auditorium required repairs, the wall containing the mural was the only one restored. 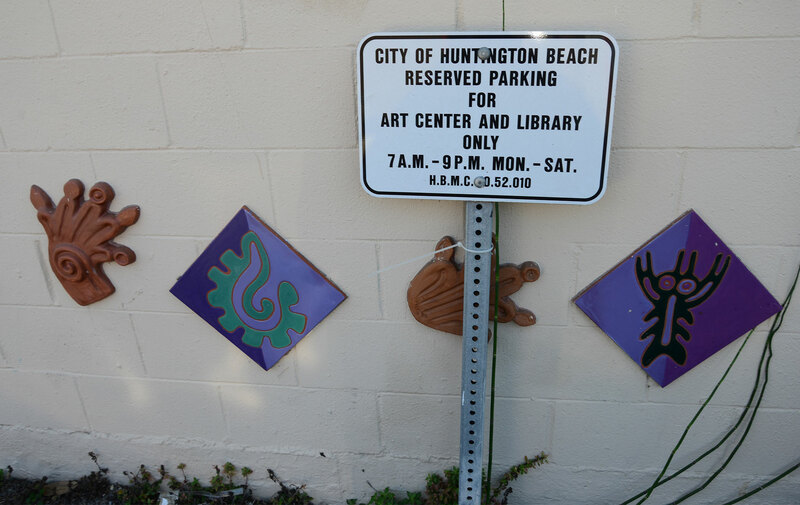 La Historia de Adentro/La Historia de Afuera (The History from Within/The History from Without) was painted on the parking lot wall of the Huntington Beach Art Center. 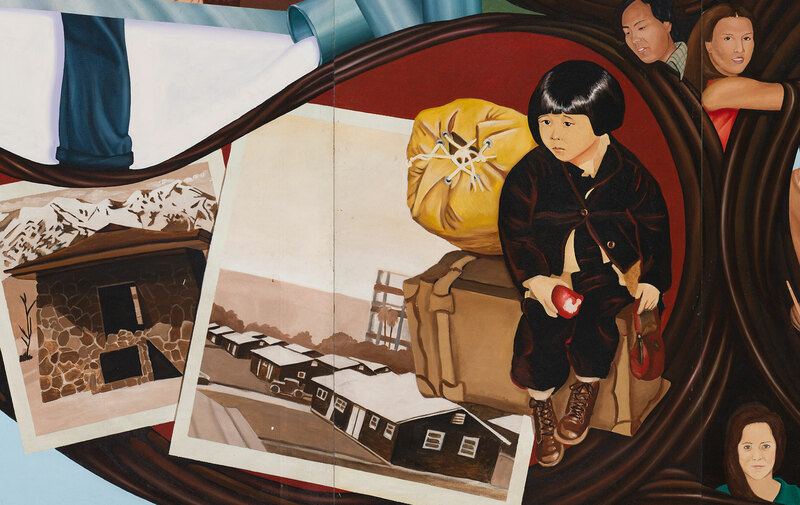 In the mural, Yreina D. Cervántez and Alma López celebrated communities of color in Orange County, representing Japanese, Vietnamese, African American, and Latina/o populations. La Historia drew from the experiences of Huntington Beach residents, some of whom served as models. 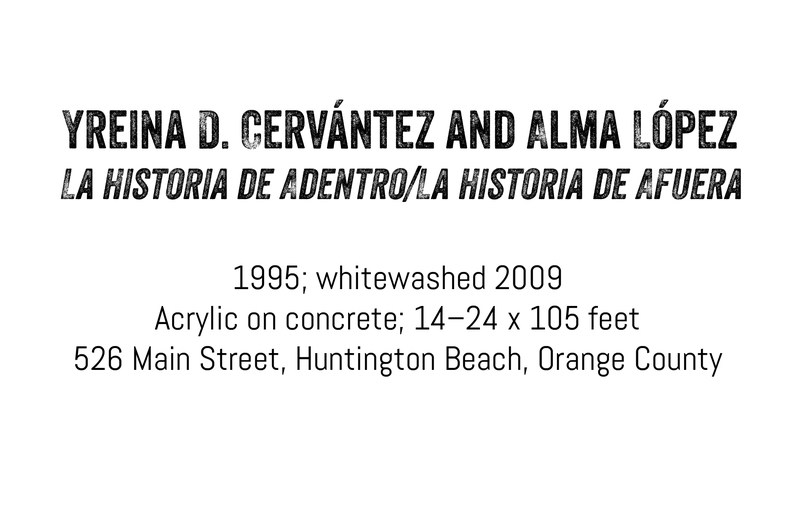 The artists interviewed and photographed Orange County Latinas to portray their stories in the mural. Their distinct perspective on local history, which included marginalized populations, was erased in 2009, when the mural was whitewashed by a new building owner. Courtesy of Yreina D. Cervántez/Alma Lopez; photo: Alma López. Images of water and waves unified the relationships that different cultures have with the sea. This made La Historia an important counterpoint to the area’s white, beach culture. Enhancing this unifying motif were ceramic tiles resembling pre-Columbian symbols. Today, they are all that remains of the mural. Courtesy of California Historical Society/LA Plaza de Cultura y Artes; photo: Oscar R. Castillo. Of the more than 45 murals Ernesto de la Loza painted throughout his career, only 8 remain, and just a handful are in good condition. 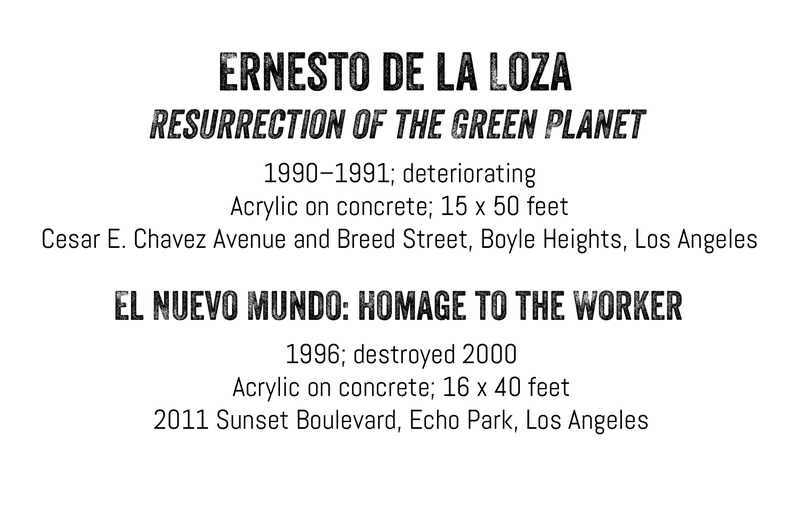 The ongoing neglect of his best-known work, Resurrection of the Green Planet, and the destruction of El Nuevo Mundo: Homage to the Worker reflect the death and near death of Chicana/o murals. Courtesy of Ernesto de la Loza. Resurrection of the Green Planet combines symbols of Mexican, Chicana/o, and indigenous cultures with messages about environmentalism. They focused on the importance of protecting three of our world’s basic elements: earth, air, and water. In this detail, a water deity replenishes the world’s oceans, rivers, and lakes. 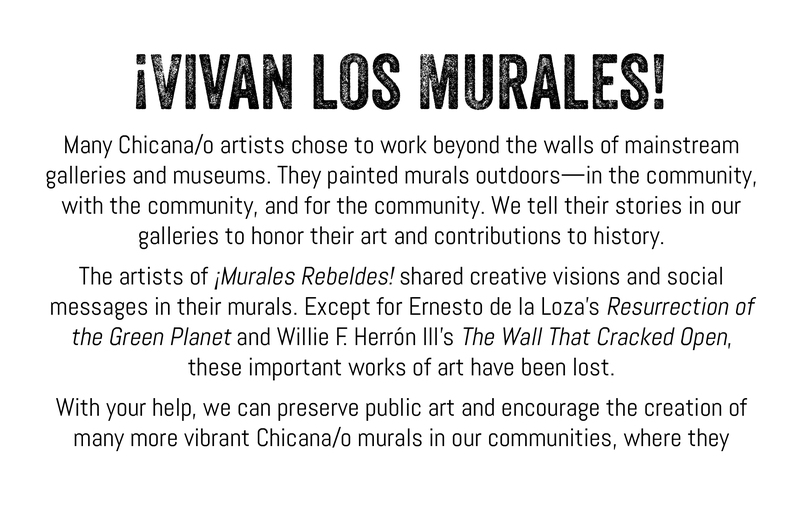 Chicana/o muralism is community-driven public art, and mural dedications mark a mural’s official introduction to the local population. Celebrations at Resurrection of the Green Planet’s dedication featured traditional Mexican mariachi musicians and dancers. De la Loza has proclaimed openly that he paints “for the people,” always aspiring to “do something relevant” for them. 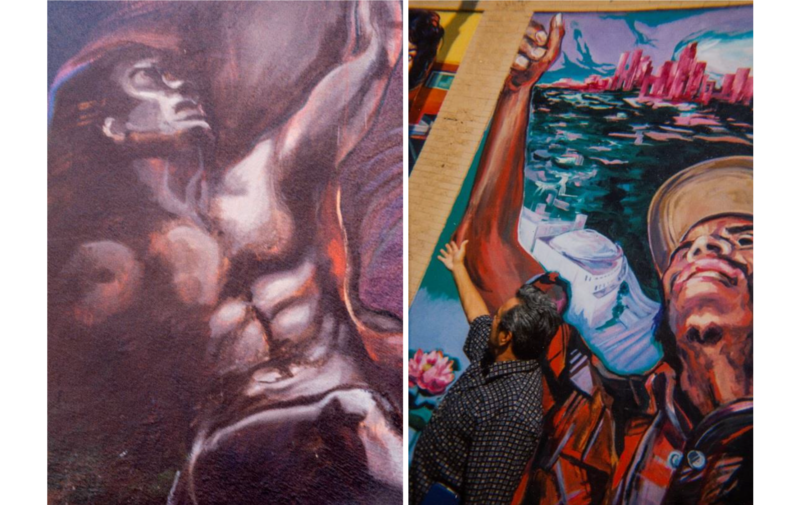 In El Nuevo Mundo, de la Loza celebrated the everyday worker, basing his figures on actual people who worked or lived in the Echo Park community where the mural was painted. From the artist’s perspective, these figures projected strength, resilience, and hope for the future. 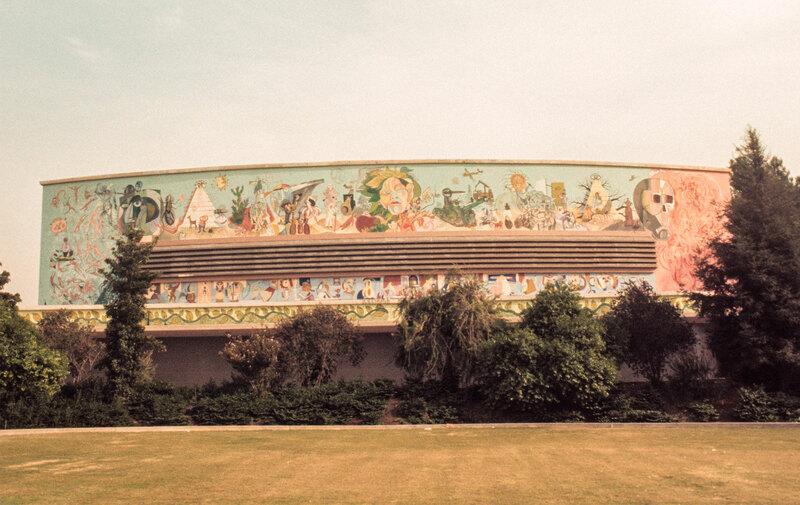 Courtesy of USC Libraries, Robin Dunitz Slides of Los Angeles Mural Collection, 1925–2002. 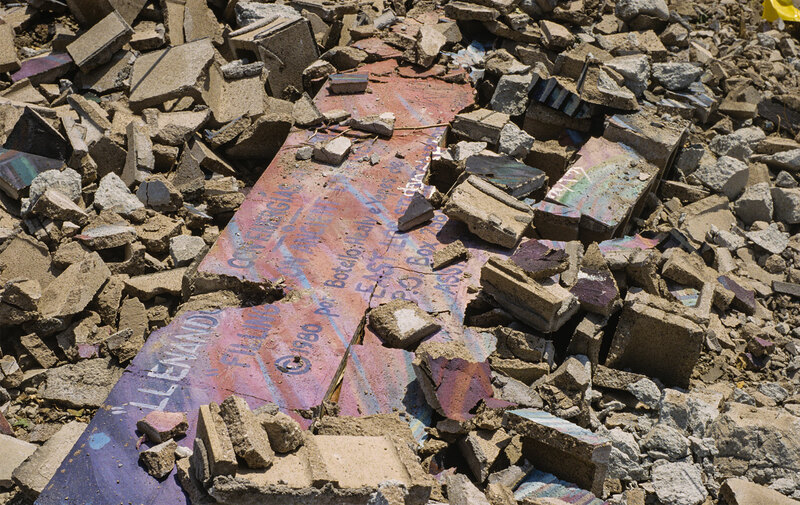 When the city of Los Angeles bought the property where the mural was painted to make way for a new public library, the mural was destroyed. De la Loza was commissioned to paint a new mural for the library’s interior. In 2004, he created Organic/Manmade, which depicts important historical figures and sites of Echo Park. 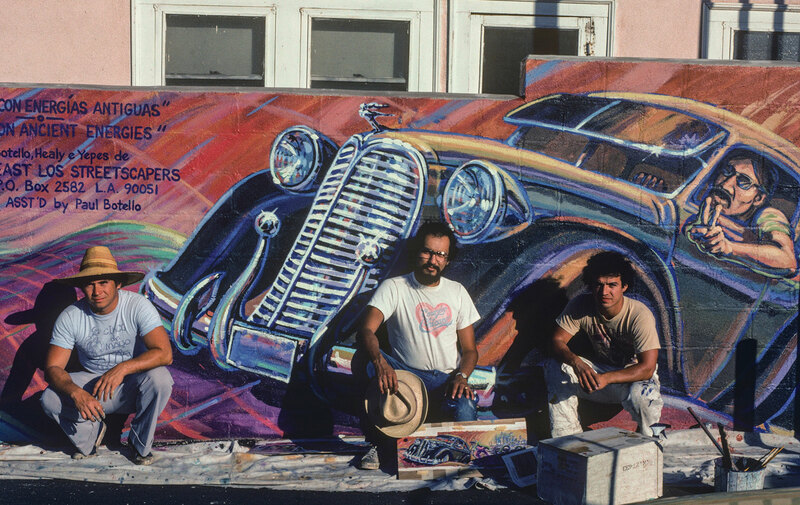 In 1974, Sergio O’Cadiz and community members painted a mural for the Mexican American neighborhood of Colonia Juarez on a wall more than 600 feet long. When a controversial scene resulted in the loss of financial support, the mural could not be completed with a protective sealing. Over time, it deteriorated until the city destroyed and replaced the wall. O’Cadiz designed more than 25 scenes illustrating Colonia Juarez’s heritage. They unfolded along the wall thematically: el pasado (the past), el conflicto (conflict), la rebelión (rebellion), la conciencia história (historical awareness), and la identidad (identity). 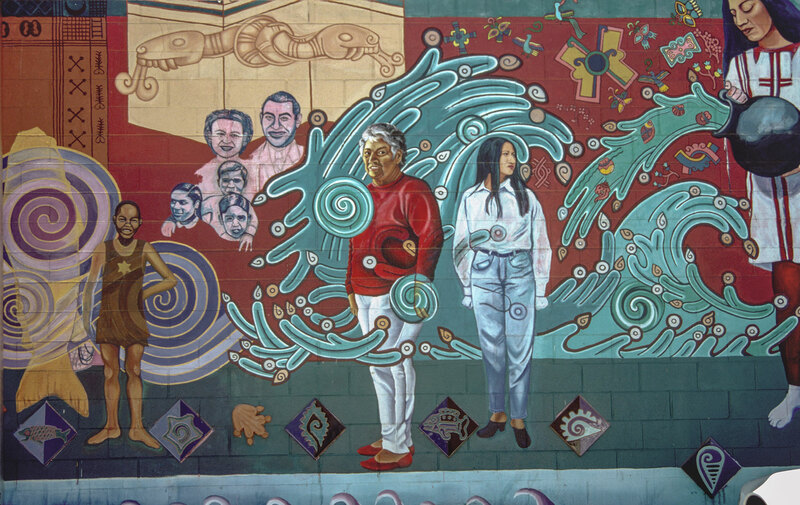 The scenes included this depiction of Chicana/o youth empowered by the Chicano civil rights movement, or el movimiento. Private collection of the O’Cadiz Family. A scene depicting a young Chicano’s arrest by police dressed in riot gear led to a controversy with the Fountain Valley Police Department. During the dispute that followed, someone threw a bucket of white paint at the scene. 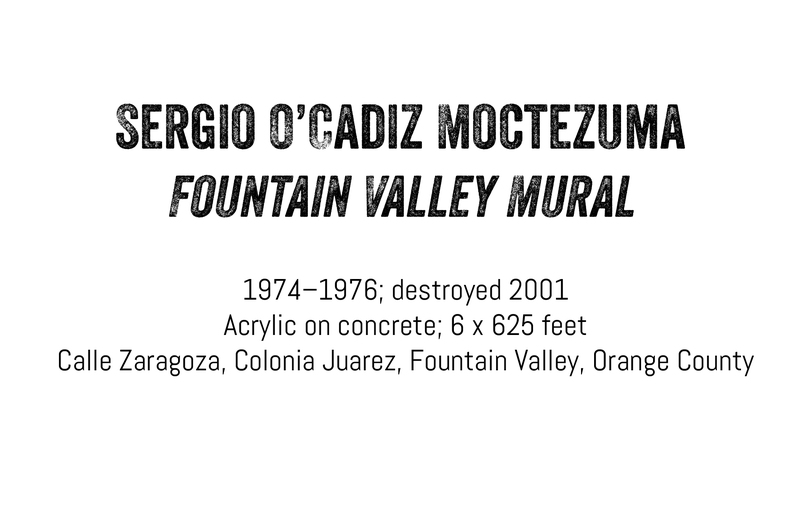 O’Cadiz chose to keep the white paint on the mural as a permanent mark of opposition and evidence of the controversy. Jeff Boice: director, videographer, editor; Lynora Boice: producer; Roberto Chavez: painting and voiceover.